Talk about a Marrakech Express! 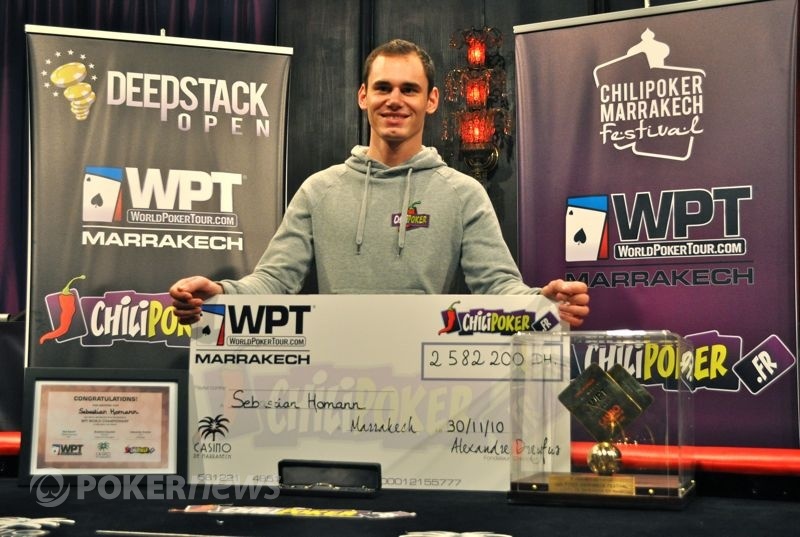 With a dominating performance at the final table in which he led almost the entire way, Sebastian Homann of Germany secured himself a wire-to-wire win at the Main Event of the World Poker Tour Marrakech presented by Chilipoker. Chip leader at the end of both of the first two days, Homann jumped out to a fast start at the final table, and just under seven hours later had claimed all of the chips and the title. Following the early elimination of the short-stacked Patrick Muleta, Homann began a rampage which left three players on the rail -- Julien Labussiere, Johan Williamson, and Dominik Nitsche -- all three felled by the German. The young Nitsche had entered the final table close to Homann at the top of the counts, but couldn't get things going today and finally succumbed in sixth. With five players left, Homann already had more than three-quarters of the chips in play, and it didn't take long for Guillaume de la Gorce and Felix Oberauer to be felted. Three-handed lasted a while longer with both Sebastien Compte and Guillaume Cescut battling gamely with their short stacks, until finally Cescut knocked out Compte and they were down to two. At that point, Homann had nearly a 2-to-1 chip lead over Cescut, but the Frenchman fought back and even grabbed the lead away from Homann for the briefest of moments. But Homann then won a huge all-in with top pair of queens on a hand that saw betting on all streets, and a few hands later was finally able to finish off Cescut. In addition to a nearly quarter million-plus Euro payday, Homann wins himself a free entry into the World Poker Tour Main Event Championship at the Bellagio in Las Vegas, Nevada in May 2011! Congratulations to Sebastian Homann! 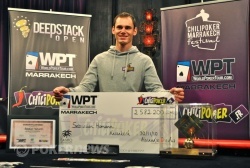 And thanks for following our coverage of WPT Marrakech presented by Chilipoker. Guillaume Cescut raised to 125,000 on the button and Sebastian Homann called from the big blind. The flop fell and Homann checked. Cescut bet 150,000 and Homann quickly raised to 375,000. It wasn’t very long before Cescut re-raised all in. Homann called instantly with , in the lead against Cescut’s . The turn card changed nothing and left Cescut with just five outs to survive. 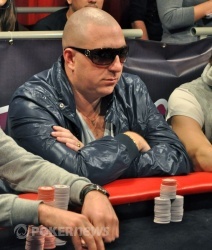 The river card was not what he hoped for, finishing in second place for €135,831. After losing a chunk of his stack to Sebastian Homann in a hand that went to the river at which point Guillaume Cescut was forced to fold, he was back down to 875,000 when he open-pushed all in from the button with and Homann called with . The board came , and Cescut's hand remained best. He continues to hang on, now with 1.7 million to Homann's 4.9 million. We're seeing some tenacity from the super-short-stacked Guillaume Cescut. And/or good fortune. He's doubled up three straight hands to move back up to 1.24 million to Homann's 5.4 million. Still a long hill to climb, but at least he's climbing. Guillaume Cescut raised to 125,000 from the button, the Sebastian Homann raised to 350,000 from the big blind. Cescut considered a moment, then called. The flop came . Homann led out with a bet of 140,000, and Cescut didn't waste much time calling. The turn was the . This time Homann bet 440,000, and Cescut waited a little longer before calling again. The river brought the and a rapid declaration from Homann that he was all in for his remaining 2.375 million. Cescut sat up in his chair at that bold move, then began to shake his head slightly as if going over the sequence of action leading to that point. He raised his eyebrows and then with a slight shrug said he called. Homann showed for queens and fours, and Cescut nodded as he mucked. The Frenchman is now down under 200,000, while Homann sits with more than 6.4 million. Guillaume Cescut has claimed a succession of small-to-medium pots and now enjoys the chip lead -- just barely -- making it the first time all day that Sebastian Homann is not in front. Cescut has about 3.40 million and Homann 3.25 million. Sebastian Homann raised to 125,000, and Guillaume Cescut called. The flop came . Cescut checked, Homann bet 150,000, and Cescut called. The turn brought the . Cescut paused a moment, then checked again, and Homann pushed out another bet, this time for 325,000. Cescut again called. The river brought the and a couple of checks from both players. Cescut flipped over , and his pair of nines were good as Homann mucked. Sebastian Homann raised to 125,000 from the small blind/button, and Guillaume Cescut called. The flop came . Cescut checked, Homann bet 150,000, and Cescut called. The turn brought the . Cescut checked again, and when Homann fired another 350,000 into the middle, Cescut let it go. Sebastian Homann folded from the button, then Sebastien Compte raised to 125,000 from the small blind. Guillaume Cescut responded by shoving all in from the big blind. Compte quickly called with his remaining chips, turning over . Cescut showed . The flop was not good for Compte, coming and giving Cescut a pair of tens. And the turn was considerably worse, leaving Compte drawing dead and making the on the river no matter. Just two remain! Sebastian Homann enjoys a little less than a 2-to-1 chip advantage over Cescut as heads-up play begins with about 4.3 million to Cescut's 2.3 million. Julien Labussiere says his goodbyes.